This "diptych" has been on my studio wall for a few months. The arrangement wasn't particularly planned -- I had two prints that were shipped in tubes I wanted to flatten out so I placed them top and bottom. But then I enjoyed having them up like this. 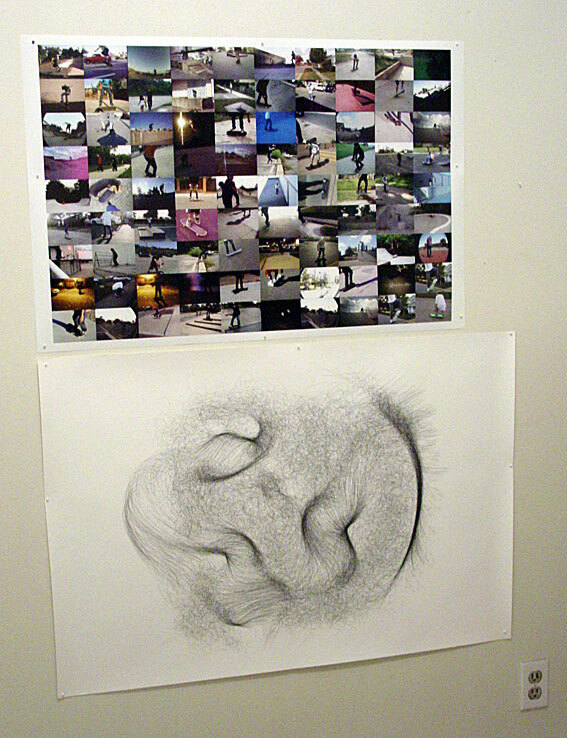 The top print is Travis Hallenbeck's collage of thumbnails of kids skateboarding, from videos on the now-defunct website Tinypic. Tinypic may still exist in some form but was taken over by Photobucket a couple of years ago. This was a raw document of the "internet street" that academics like to talk about and Hallenbeck's grid arrangement combines art and ethnography. When you have a piece like this up for a while you notice more and more details: the color (mostly accidental from the video camera settings and printing); cropping (whatever frame Tinypic "chose" to represent the video); lighting (a kind of uniform twilight glow, again mostly accidental). Very few faces can be identified owing to the cropping and blurring of "action photos" so what you mostly have is a series of ritualistic poses, almost like a semaphore chart. This is a great example of "net art" in that it has a pure social media origin and is filtered through the consciousness of an "eye" making decisions and choices (while still somehow maintaining a matter-of-fact, documentary look). The bottom print was a gift from a past Rhizome.org fundraiser; the artist is Casey Reas. It's probably meant to hang in a portrait orientation but I prefer it landscape so I don't get the suggestion of a surreal head. It's a generative work where the computer simulates a flocculent texture of hundreds of fine curved lines, growing thicker and thinner and bunching together at seemingly-random points. The suggestion of 3D depth and the high quality of the print give these swirls a strange sort of presence that grows on you over time. (After an initial impression that it's a "mere technical exercise.") An interesting example of digital abstraction that holds up as a wall-object. Update: Thanks for the email identifying Casey Reas as the creator of the second print.